‘Burrows, le Pantani Anglais,’ said the French papers - when PEZ saw that le Plateau de Beille climb was included in the 2011 Tour route we decided we had to have a word about it with the man who once held the record for the tough 10 mile ascent. 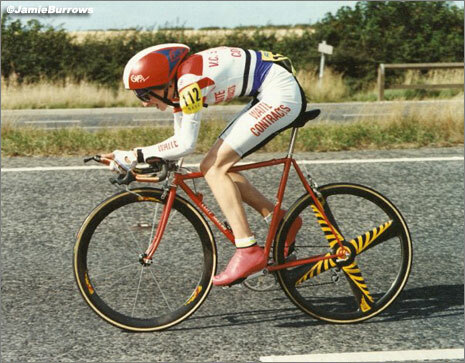 Jamie Burrow was rated number one under-23 rider in the world, he turned pro for US Postal as a team mate of Lance Armstrong and despite some very promising rides in the pro ranks he never scaled the heights expected of him. In recent years he re-invented himself as a top Gran Fondo rider and was about to launch a career in cyclo-cross when a bad crash put paid to that. But he’s bouncing back again as an hotelier and took time out from renovating the property in Rimini to talk mountains with PEZ. PEZ: Have you recovered from your injuries, Jamie? Jamie: Yeah, I was only out for six weeks but of course that was long enough for all of my form to have gone. I still travelled up to Belgium but when I got there the weather was really bad with all the snow so I couldn’t even train properly – with the benefit of hindsight I shouldn’t have bothered; but there were three new ‘cross bikes in the garage and I didn’t want to waste all that effort. 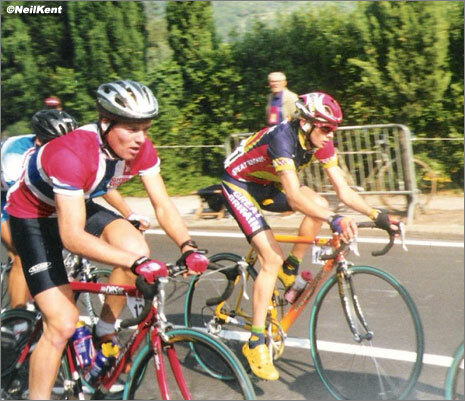 Burrow in action with Jan Ullrich at Zueri-Metzgete in 2000. JB: No, I spent a year planning it and thought that maybe I could get some form for the races over Xmas but like I said, the weather was so bad that I couldn’t even train. JB: No, I’ve been involved in renovating the hotel and getting our marketing strategy right, all year – I’ve spent a lot of time with a paint brush in my hand! 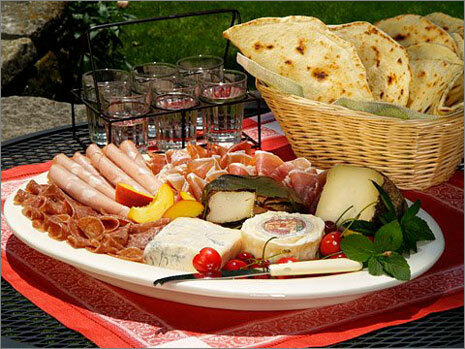 We hope to be open from early April until September and attract cyclist as well as Italian holiday makers. There are other cycling hotels here but they don’t have staff with a cycling background, like I have. 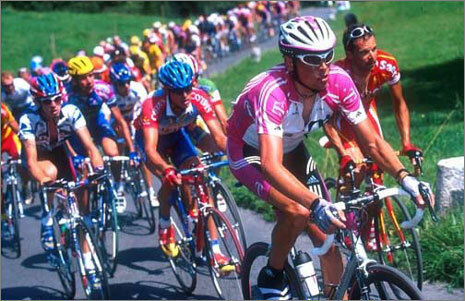 JB: It was stage two of the Ronde de L’Isard which was part of the 1999 UCI under-23 World Cup. We were an Italian team (UC San Paolo) and knew of most of the French climbs but hadn’t heard of the Plateau de Beille when the organisers faxed us the parcours. Then someone said it was the one where Pantani had won in the 1998 Tour – I think that was the first time that it was used. We got hold of videos of Pantani’s win and sat down and studied them. As I remember, it wasn’t like your typical Alpine pass, there weren’t that many hairpins but I remember that it was pretty open at the top. There was a break up the road, I felt good and our team rode tempo to get the gap down; then on the lower slopes of the climb my team mate Sylwester Szmyd (now a key man with Liquigas) took it up and one by one the lead group whittled down to seven or eight, I went with about 12 to go, caught the break and won by two minutes from Sylwester – he was able to just sit in the wheels once I went. JB: I don’t remember but the Ronde was in May and the day was overcast, the Tour is July and it’s much hotter so maybe it’s heavier for the pros? PEZ: What was the bike? JB: It was a Cannondale – we had the same sponsors as Saeco-Cannondale. I was big into making sure my bike was ‘just so’ – the Italians much less so. That’s because even from the age of 12 they’re given bikes from their teams, whilst I grew up in a cycling family and had to buy equipment out of my pocket money – I was always aware of what was current, what was good and what wasn’t. Jamie: Pantani did 43:30, some sources say that I did the exact same time but some said that I beat it by one second. When my manager was looking around to get me a pro contract we had a brochure made up with my press cuttings and performances – I think that ride was very helpful in getting me my contract with Postal. PEZ: I believe you won the time trial stage the day after Plateau de Beille stage? JB: I was riding Ivan Gotti’s time trial bike and that was a strong positive mental factor for me. I beat Thor Hushovd, he was reigning world U23 time trial champion and I expected to get a battering from him but my morale was good after my victory the day before and the bike helped too – I beat him by 22 seconds. After that we just had to defend my lead on GC and I ran out overall winner. PEZ: How does the climb compare to the Italian passes? JB: The French climbs are steadier, they suited me better because I always climb seated – I was never a pure climber but weighing 59 kilos I could handle six or seven percent climbs very well because I had a good power to weight ratio. That meant I could time trial too, but when you got onto the steeper Italian climbs it didn’t suit me so well – you use up a lot more energy climbing out of the saddle. I could climb at 177/178 heart rate for an hour but never got the chance to ride that kind of climb as a pro. I’m not saying I would have been winning on those climbs but when it got down to 30, 20, 15 guys then I think I would still have been there and been noticed. Changes in rhythm are hard on you but necessary on the Italian passes; it surprises me that Basso as the classic seated climber ‘rouleur’ was able to win on one of the steepest climbs in Europe, the Zoncolan. PEZ: And will you be watching the stage on TV? JB: Yes; I watched the stage on TV a few years ago and whilst I was watching it I received a text from one of my old UC San Paolo team mates – he did his three or four years as an amateur but never turned pro and got a job – reminding me about the time he’d ridden tempo on the flat into the climb and then how I’d gone on to win on the stage; it was cool to know that he still had those good memories of the day.